Ever since I was gifted my sourdough starter four years ago (thanks Celia! ), I have been baking bread. I'll admit it, I've had some shockers during my bread baking journey - and yet every single loaf I've turned out I've been ridiculously proud of. I still can't believe that I thought learning a new hobby with a newborn would be a smart idea. Actually, now that I think about it, I also can't believe that my little Attila the Bun will be four this year... not so little and bun-like anymore! So years later, I'm still baking regularly. I can say with complete honesty that my loaves aren't perfect - they're rustic and not at all fancy, but they're edible and friends ask me to bring them when we have gatherings so I must be doing something right! I like making regular sourdough loaves and I'm a big fan of fruit and nut loaves (I recently posted a pineapple and date loaf which I'd love to make again with some hazelnuts included). I can also do a decent focaccia which seems to be a hit. Lately, I've started making extra discard on purpose, and using it to branch out from just regular *bread*. Here are some sourdough crackers that I made using the King Arthur flour recipe as a base. They turned out great and way better than store bought crackers. I can't believe it took me so long to make them when I've heard so much about home made crackers. I love to go really heavy on the herbs and not be shy with the salt on top. These are a huge hit with everyone I've shared with. Here's another shot with them next to some simple chia loaves that I baked to take to work. My co-workers have been asking for a loaf for awhile so I was happy to oblige! 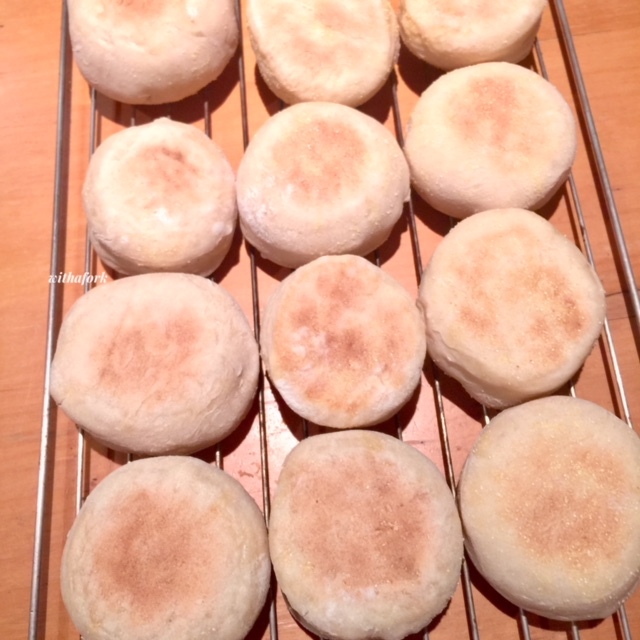 Finally, this is my latest creation - sourdough English muffins. I was so ridiculously excited to bake these that I got up at 4am on a weekday, snuck out of bed so the kids didn't realise I'd left (they are very snuggly, clingy and warm so this was hard) and crept into the kitchen to finish off the baking after letting them rise overnight. I didn't use a single particular recipe for these, but an amalgamation of a few that I found online. I didn't want to use dairy milk so I subbed in almond milk instead and I think they turned out pretty good. Next time I'll cook them a little longer so they brown more, but I didn't hear any complaints when I served them up warm for breakfast. I'm sticking all of the leftovers into the freezer so I don't eat them all, they are that tasty! So, to all the bloggers who have been so generous with their knowledge and inspirations... literally thank you for giving me my daily bread. Thanks for what I've taken to calling my breaditation moments - when I sneak out of bed early, when the house is all quiet and still and I can knead and shape and bake in the silence. Then, if I've managed to do it quietly enough, I can enjoy a cup of coffee while the house is still asleep and watch the sun rise while the baking bread smell wafts from the oven. It's my favourite part of the day! wow your sourdough baking looks great! I too have a starter and am amazed my starter has survived and am not sure it would without online guidance. I am marking these crackers to try - we are crackers for crackers lately so if I could make these I would be so happy. I wish I could crawl out of bed at 4am but I think I would be so grumpy it would not be worth it - but I love fresh bread for lunch :-) And I would be interested to see where you got your muffin inspiration from - I'd love to try english muffins with sourdough - but hope my next sourdough efforts will be hot cross buns. Thanks Johanna! I hope you like the crackers - I've gone a bit mad for them and have made all kinds of variations lately. Lucky we love them here too! I have to admit I don't make a habit of 4am but I REALLY wanted those muffins. When I have some time I'll blog my version of the recipe. I'd love to see how your hot cross buns turn out too! I laughed at your reference to planning a new hobby with a new baby. The things you plan before you enter parenthood ;) In your case, though, you did it so congratulations on the years of bread making and your growing expertise! I am really impressed and think all the flavours you mention plus these offshoots sound delicious.